From looks alone, our 5' Poly Porch Swing inspires a feeling of nostalgia, bringing you back to a simpler time when life moved a little slower, days seemed a little longer, and everything was a little easier. Take a seat and all these feelings will come back as you spend your days enjoying the rhythmic swinging motion, while taking in the serene beauty of your natural surroundings and sipping on your favorite beverage. Available in a wide variety of solid and two-tone colors, you can choose the perfect swing to match your space and complement your porch or patio. 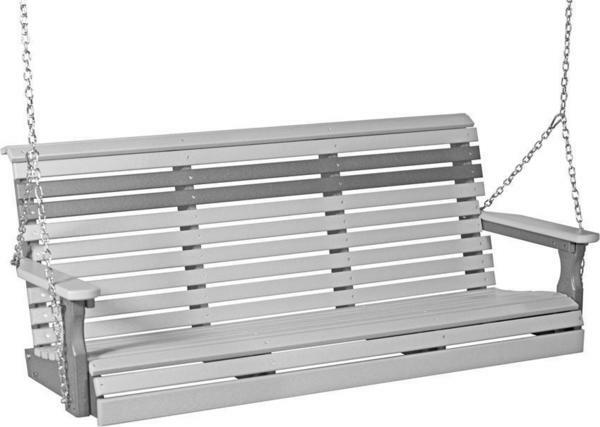 Complete with two stainless steel chains, this swing can be mounted in a variety of locations, giving you the freedom to choose your favorite place to relax. The material used to make these beautiful swings is eco-friendly in nature, utilizing recycled milk jugs and detergent containers, keeping them out of landfills and giving them new life as amazing pieces of outdoor furniture that you can enjoy for decades. Each poly board used offers a UV inhibitor that allows your vibrant color to always look their best, keeping the free of fading and bleaching from sun exposure and weathering in adverse conditions. 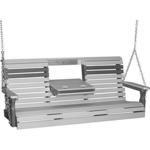 You can also take confidence in knowing that your new swing will not crack, splinter, chip or rot over time, giving you a place you can rely on whenever you're ready to take a break. Not what you're looking for? 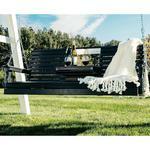 Check out the rest of our Amish porch swings!